Gareth Lockrane has established himself as one of the finest jazz flautists in Europe, with a string of high profile appearances alongside the likes of the James Taylor Quartet, Natalie Williams and the late, great, Bheki Mseleku. It is a measure of Gareth’s growing international standing that he was named “Rising Star on Flute” in the prestigious Downbeat Critics Poll (USA), just one of many awards and accolades he’s received. 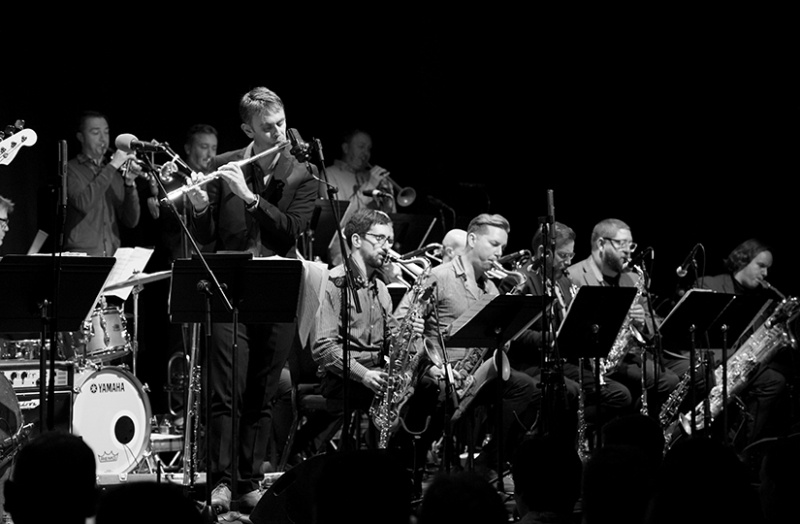 This afternoon Gareth will be fronting his 18-piece Big Band that will perform his arrangements of a mix of originals and the odd classic jazz standard, many of which are featured on the band's latest CD "Fistfight at the Barndance". Given Gareth’s standing on the UK scene it’s not surprising that his Big Band attracts some of the finest players around and this afternoon is no exception, featuring a host of high profile award-winning musicians including Julian Siegel, Mike Chillingworth, Richard Shepherd, Olli Martin, Trevor Mires, Tom Walsh, Henry Collins, Steve Fishwick, Ross Stanley, Mike Outram, Ryan Trebilcock, Ian Thomas...Not to be missed!